Every year at World Maker Faire, we face the challenge of powering a dozen graphing calculators for two long days. While the newer calculators with rechargeable batteries can be powered over USB, the older calculators can only be powered with AAA batteries. 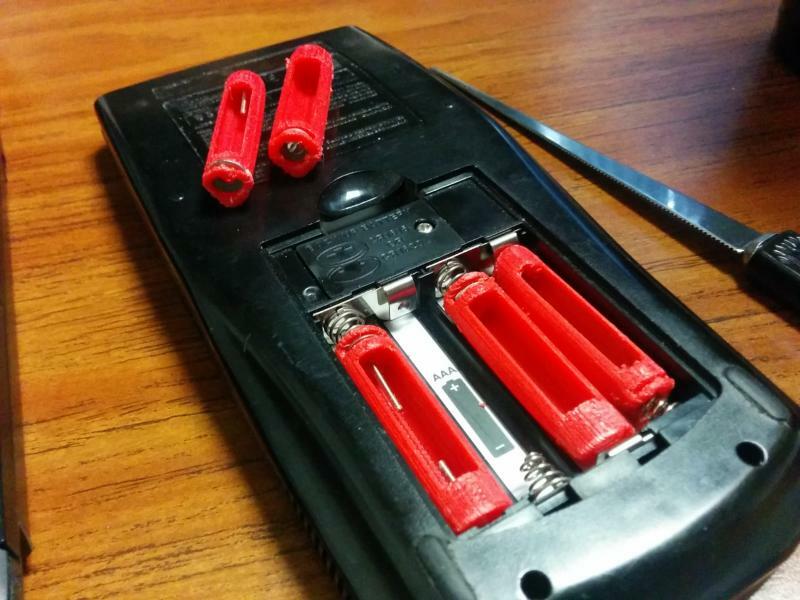 Since 2012, our solution has been to use dead AAA batteries to wedge wires against the positive and negative terminals of our calculators' battery compartments, then connect those to a 6V cell phone charger. However, as the Faire progresses and young visitors try to pull our displays closer to them, these wires would sometimes get pulled out. This year, with two of our members in possession of 3D printers, we decided to try something more polished and more reliable. By attaching wires to the two screws, we could make solid electrical connections to the devices' battery terminals. 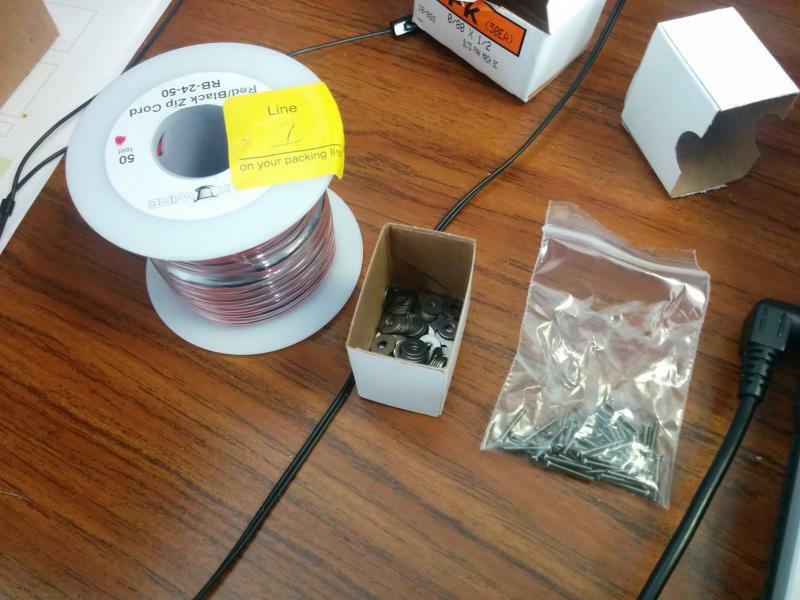 With these in mind, we set out to design a 3D-printable design for a battery that could hold these screws and washers. 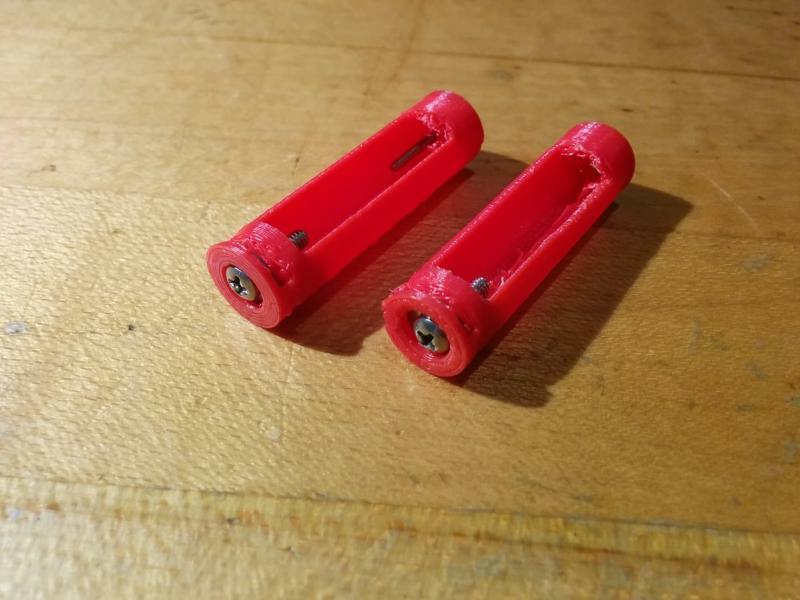 McMaster-Carr parts for 3D printed AAA batteries (left); finished 3D model (right). Click to enlarge. Although we use other 3D modeling software for more complicated projects, we used TinkerCAD (from Autodesk) to model our AAA batteries. It offers easy-to-user Boolean modeling operations, so it took us adding and subtracting a number of cylinders and rectangles to get to the model shown above and below. This model required a bit of fine-tuning, both to perfect the model and to get it to 3D print properly. Both geekboy1011 and I have XYZ Da Vinci 1.0 printers, so we each attempted to print the model. The first and second iterations (the first two images) below were printed horizontally on my printer, and both are slightly lopsided as a result of insufficient support material added by the slicer. The washer pocket on the first version was too small to fit our washers, and wasn't thick enough to stay together during printing. The washer pocket was deepened and thickened on the second version, but the print quality was still subpar. Geekboy1011 tried printing the batteries vertically, with the negative terminal against the printer bed and the positive terminal at the top. Since the quality was much better this way, the third and fourth versions were sliced and printed vertically, using Cura rather than Slic3r for slicing. The only difference between versions 3 and 4 is a deeper cylinder of plastic behind the positive terminal to give the 0-80 machine screw more support plastic. The fourth version below worked well once the screws and washers were inserted, so wires were soldered to the positive and negative terminals of two batteries, and successfully powered the blue TI-83 Plus in the photograph below. 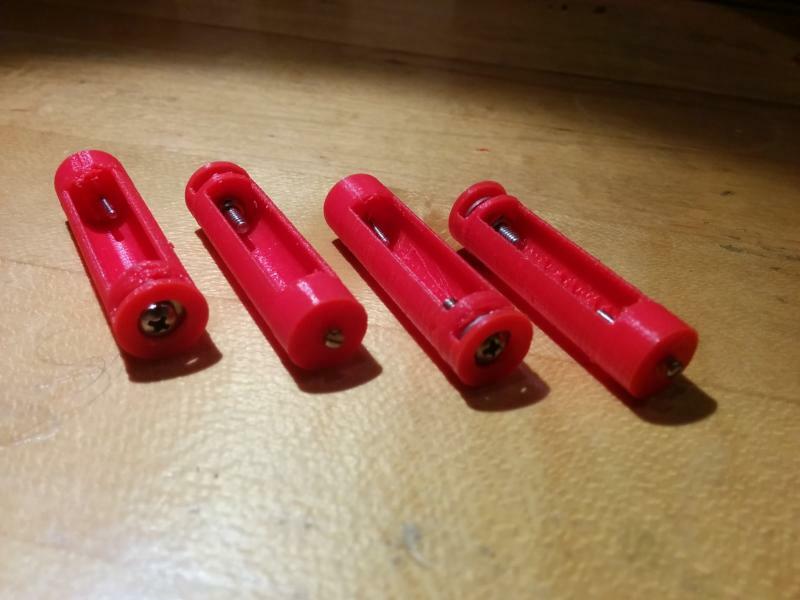 If you'd like to 3D print your own AAA battery inserts to power your own devices, the STL and a readme file with further instructions are available at the link below. We'd love to hear your feedback if you try printing these, and come see us at World Maker Faire in New York City if you'd like to see these in action. From left: first, second, third, and fourth iterations of the batteries, along with the final product in a blue TI-83 Plus. Click to enlarge. This is awesome. I might try to scale these up to an AA version down the road for RCX. Looks great! I hope they hold up well over the course of Maker Faire. Even with the printouts, there is still that wire sticking out the back of the calculator. I know that cutting up the calculators is not in your best interest, but it seems that without a cover for the batteries, the inserts would fall out. Are you going to use battery covers that have holes for the wire, or are you going cover-less? Hm, these look pretty neat! Is there anything useful that could fit inside of the empty space within the holder? Makes me wish I had a 3D printer. 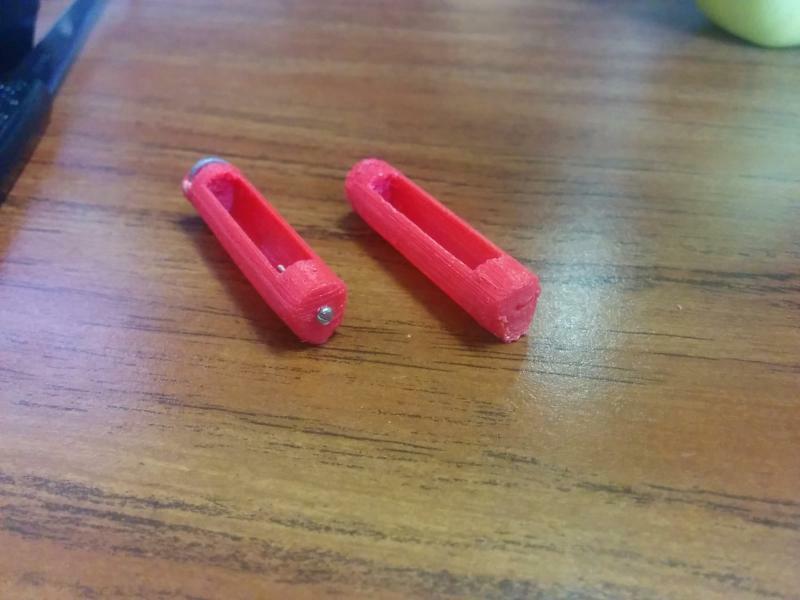 If these are 3D printed, then what metal components will need to be added to make them usable? This idea is amazing. I have been wanting a product like this for years. Finally, the Idea has sprung! Anyway, what wires and metal parts would need to be added, and How could I get them? After viewing the README file, i have seen that I need some screws and washers. New quetion: do i install these after th screw is already printed? There are a wide variety of materials available for 3D printing; however, ABS plastic is the most common. 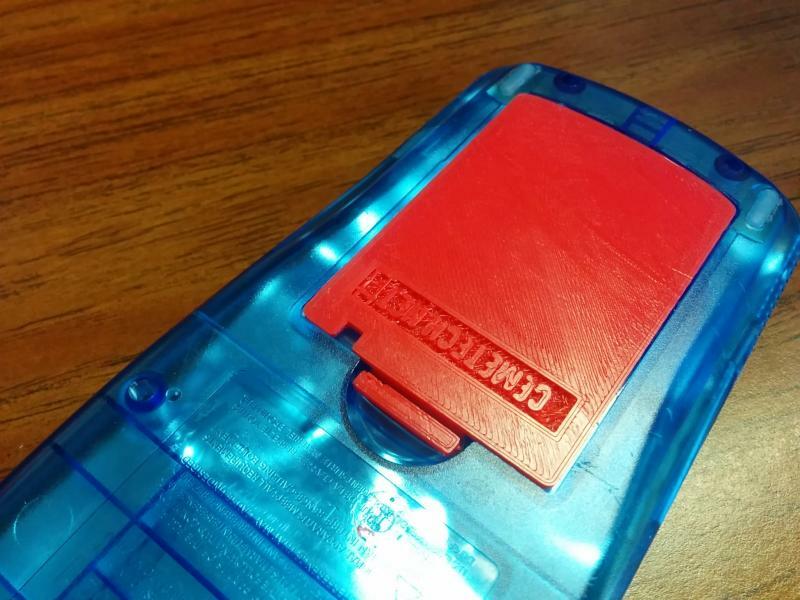 The calculator case is also made of ABS, so a printed cover lightly brushed with acetone would have similar characteristics. It's meant for the wires, plus a little hot glue or epoxy if you want to add strain relief of sorts, but if would be cool to be able to fit something interesting in there. If you have a device that took 4xAAA batteries, you could combine two of these batteries and some extra material with a Li-Poly battery to make a non-rechargeable device rechargeable, fitting the edges of the Li-Po battery into those cutouts! That's a good question. In the past we've used wires thin enough to fit in the gap between the battery cover and its latch, but this is no longer the case. 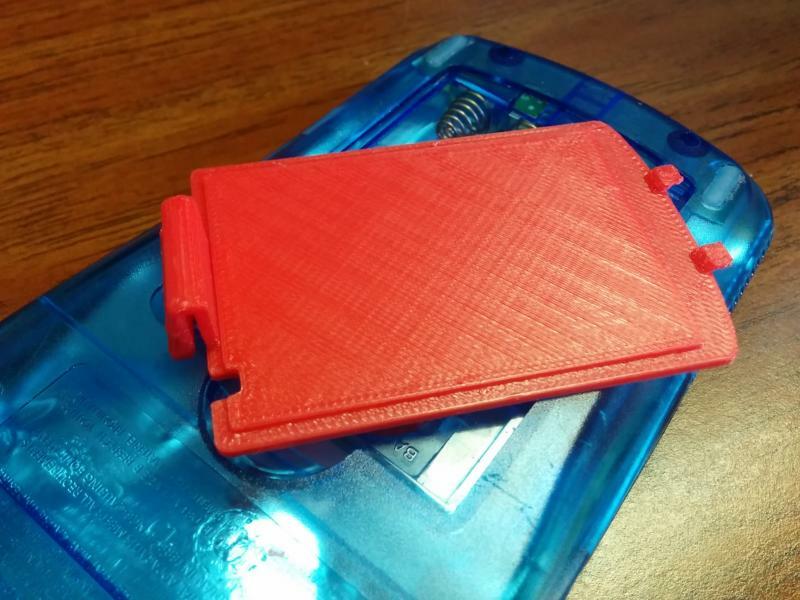 I can try to quickly model and print battery covers for the calculators to be powered this way, or I can cut into some of my many TI-83+/TI-84+ battery covers, which I'd like to avoid. This information is all in the post at the top of the page. Please read it. You insert one washer into the washer pocket, screw in two screws, and add a nut after a battery has been printed. Just want to make it clear that acetone serves to smooth ABS rather than change anything about its flexibility. Other than that, this is correct. The acetone helps to fuse the layers together so they don't break apart when flexing. Depending on the quality of your 3D printer, this may not be necessary. Hmm, my experience and reading indicates otherwise. If the internal portions of your layers are not melted together properly, using acetone to re-fuse just the surface of the object will yield something very weak indeed. If your objects are delaminating, then your speed or temperature are off (or you're trying to design something with too thin walls that has to stand up to too much force). That is true. ABS probably isn't the best option for parts intended for intense or repeated flexion anyway. My planned project for this Saturday was literally hacking a battery-powered clock so that I didn't have to rely on battery power. Your post appearing on Hackaday could not have had better timing. Great riff on the project, MakerMusings, and a very nice writeup! I'm impressed with the tapered top that removes the need for supports; I printed my version with supports. Hope you'll stick around and share some of your other cool prototyping and electronics projects with us in our Your Projects subforum (and perhaps Introduce Yourself if you get a chance). Does anyone know of a quick reliable place to use a 3D printer for Cheap? That's not strictly on-topic, but Shapeways is probably your best bet. Since I never got around to updating this: we ended up making custom battery covers for Maker Faire, a TI-84 Plus one based on a published TI-84 Plus battery cover design from Thingiverse, and a TI-83 Plus one that I threw together using TinkerCAD from measurements and two iterations on my printer. Thank you guys for the suggestion! Looks great! I can't wait to see them in person tomorrow! It is nice to see how cool it turned out at the end. Next suggestion from me is an all in one 3D print out allowing integration of recharging port with the necessary circuits and some slim battery, etc - I hope to figure out how to do similar thing with the whole back cover on Casio FX-CG one day just to make it slimmer (as per my post in the Casio Prizm forum https://www.cemetech.net/forum/viewtopic.php?t=11814) but haven't even figured out to how to wire all safely. Great job! i love the idea! © Copyright 2000-2019 Cemetech & Christopher Mitchell :: Page Execution Time: 0.406270 seconds.